ShorelineStyle.com hunts the globe for the most unique coastal styles. Whether you are looking for area rugs, art, lamps or furniture, we have it all. Not only do we offer the very best prices on the web, our customer service is second to none! Our partnerships with some of the industries great manufacturers allow us to get you your item faster than anyone else, with some even shipping the same day they are ordered! We only deal in genuine, first quality merchandise and offer a 30 day risk free trial on all purchases. And don't forget, at ShorelineStyle.com you will get our exclusive FREE SHIPPING along with our 100% SATISFACTION GUARANTEE! In the beginning, ShorelineStyle.com started off as an area rug supplier focusing on the latest trends in coastal style. However, it quickly became apparent that our customers were looking for some unique items to go along with their amazing rug. Feel free to browse the many amazing finds throughout our catalog. As we have said, we are all about customer service. If you still need some convincing, feel free to browse some of the awards we have received below. 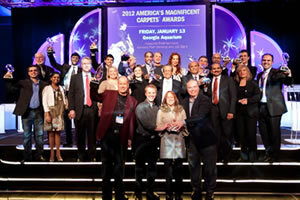 In a format modeled after the film industry's Academy Awards, we were recently awarded Best Area Rug Retailer in America by AmericasMart and the Oriental Rug Importers Association (ORIA) during the International Rug Market in Atlanta, Georgia. This top honor signifies that we are considered one of America's top rug retailers by industry peers. For the past 25 years, the Herald Tribune, a New York Times affiliate, has awarded our company the honor of the best area rug store in its annual Reader's Choice Awards. This year, over 25,000 readers voted in the Reader's Choice Awards and declared that we are the "Best of the Best." We are a proud recipient of the The Greater Sarasota Chamber of Commerce Small Business of the Year award. Honoring locally owned business who focus on honesty, integrity and service, this is Sarasota's most prestigious business award. The SRQ Chamber of Commerce presented us with the Insignia Award for Best Customer Service. The Chamber of Commerce presents the Insignia Award to a company or organization in recognition of its quality service and commitment to the community under The Chamber’s Code of Ethics. Every year, locals are asked to help choose what they love most about the west coast of Florida. In 2018, they responded in record numbers and voted us "Best Place to Buy Floor Covering." The “Platinum 100” is a comprehensive listing of the area's top luxury retailers. The list is limited to the top 100 retailers who meet the judges' criteria for a truly outstanding shopping experience. To make the cut, "each store is vetted, both for its product line and the shopping experience itself, from the environment to the sales staff and service ethic." Angie’s List, the website allowing members to post and access reviews of businesses they patronize, has awarded us an "A" based on actual reviews by our customers. We are proud to announce that we have also been awarded a coveted spot on the "Angie's List" Honor Roll. Less than two percent of merchants qualify for this honor, which awards businesses that take customer service to the next level. The Better Business Bureau has awarded us the highest (A+) rating possible. The rating takes into account many factors such as customer service and satisfaction. ShorelineStyle.com is wholly owned and operated by its parent corporation Rugs As Art, Inc. The family-owned business began in an 800 sq. ft. store in 1986 on Florida's west coast. With humble beginnings, the company was founded on the principles of providing quality area rugs with superior selection, outstanding customer service and unbeatable pricing. That selection has always included top quality traditional Orientals, world-class contemporary designs and many levels of classics in between. In 1989, the company moved to a larger location including a new 4,500 sq. ft. retail space. Continued growth and national recognition were bolstered by aggressive advertising, including television and print media. The company was one of the first to go on-line (1992) offering various rugs for purchase and the clientel grew to both national and international. Focusing on those same principles of selection, service and savings gave the company a loyal following, allowing it to expand in 2001 into a new 18,000 sq. ft. retail space. Fourteen foot ceilings, handsome hardwood flooring, excellent lighting and efficient rack systems accommodated several thousand rugs, accessories and furnishings. Fast foward 31 years from those humble beginnings and the award-winning company (recently named Best Rug Store in America) has grown to include ShorelineStyle.com, its ecommerce coastal living presence servicing the globe. It's truly amazing what can happen when you never forget that the customer always comes first! No matter how large we get, we never forget our mission: Provide the best prices while offering the best customer service possible! Give us a chance and you will see why we have been named #1 time and time again!